You are viewing the archive for the ‘Myanmar Restaurant’ tag. 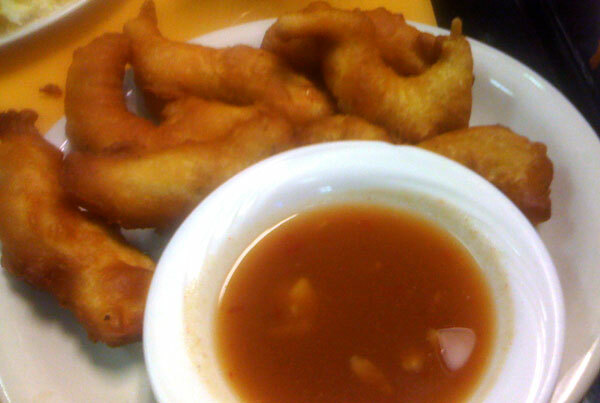 I first went to Myanmar Restaurant in Falls Church VA few years back. I was not immensely impressed. The food was decent but not great enough to go again due to its location. Basically, it didn’t live up to my friend’s stellar review. For me, Burmese cuisine uses many of pan-Indian spices with components of Thai cuisines. Some Nepali expats find similarities between some of the Burmese dishes with their own cuisine. This time, on insistence from another friend, who might have heard from the same group of friends, I went to the restaurant again. I already had sushi before going to Myanmar Restaurant, so I was not hungry. My plan was to either get a drink and/or share an appetizer. I passed up the drink. 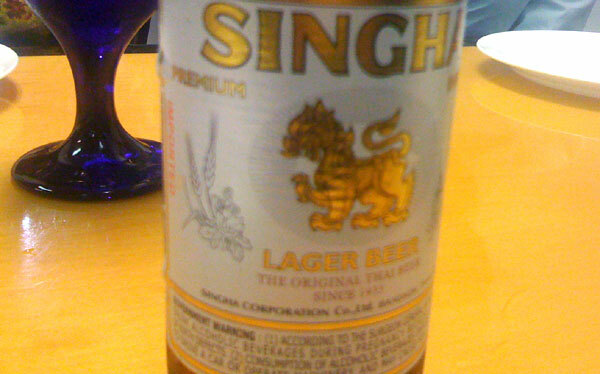 Everyone chose Singha beer. If you have never had this Thai beer, it is a lager style beer with somewhat light sweet aftertaste like Jamaican Red Stripe. We started with “crispy chicken” appetizer, which is boneless chickens in thick spongy coat of batter served with a broth-like sauce. The chicken appetizer came with 6 pieces. Since we went in a group of 7 people, one of a friend N’chal asked if it is possibility to get an extra piece. The waitress gave a polite smile but didn’t say yes. But our crispy chicken did come with the extra piece. 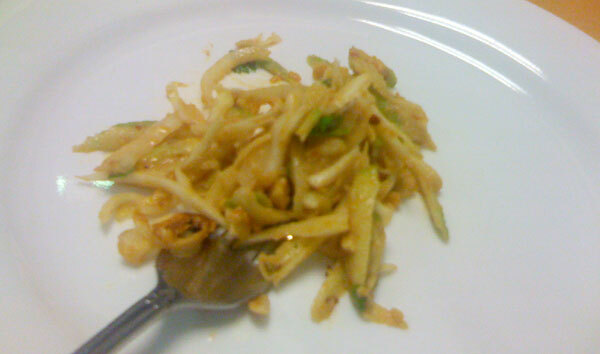 “Mango salad” was thinly sliced pieces of tart mango, onion and cabbage. It had crushed peanuts and cilantro. I am sure it was coated with roasted ground chickpea flour because giving it the nutty flavor. This is perhaps the most uniquely Burmese dish. I highly recommend any of Burmese style salad unless you are allergic to chickpeas. I was supposed to share the “fillet fish curry” with M’deep. 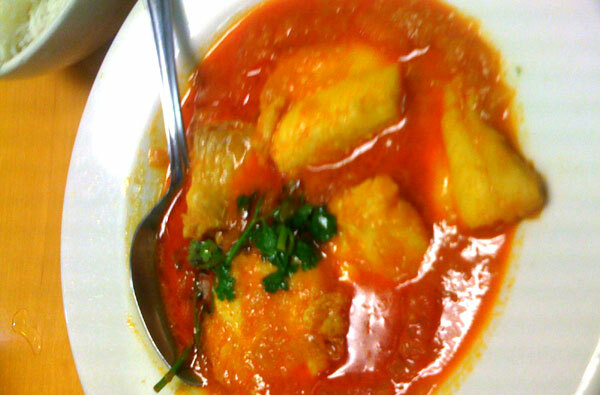 The fish curry came in a tomato broth and we had option of choosing salmon, catfish, or tilapia. I believe we chose catfish. The fish curry was good enough that Mr. M’deep, who was slightly hesitant about spiciness of the dish, decided to finish majority of it even though it was spicy hot. 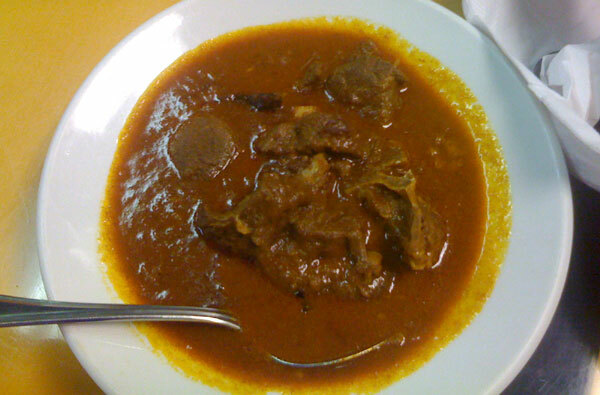 Most of us went there for their “mutton curry” (goat) which is made of curry and onion based sauce. The dish lived up to its expectation. It was hot but spices were balanced well and meat was cooked perfectly tender. Unfortunately, they ran out of the mutton dish and had only one serving. 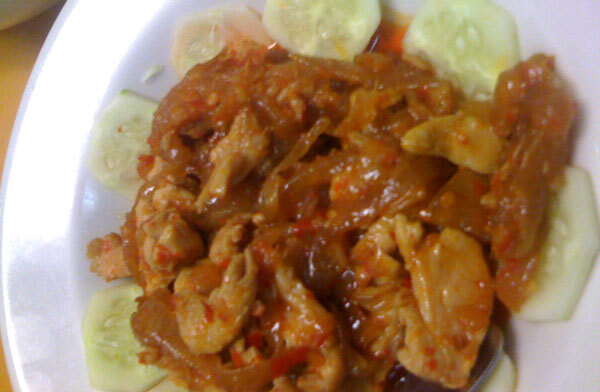 We shared and tried another dish called “chili chicken”, which is a hot spicy chicken dish with onion and chilies. Cucumber served in side did help to cool off the extra heat from the spices. This dish is recommended with reservation to those who can stomach the heat. A few other dishes we got such as sautéed beef kabob was average. Everything else seemed reasonably well prepared and priced in this mom and pop establishment. I haven’t tried any other Burmese restaurants in the DC area (Burma Restaurant‎ in DC and Mandalay Restaurant & Café in Silver Spring, MD), so can’t give my opinion based on comparison. Nevertheless, I would definitely go to Myanmar Restaurant again. If you want to go there I recommend their fish, mutton, and out of all, for their unique salads.